The fact that diabetes is characterized by high blood glucose or sugar levels has led to misunderstandings about the role dietary sugar plays in diabetes—and whether a fully sugar-free diet is necessary. Step away from the donuts. That choice might be obvious if you have diabetes. But there is hidden sugar everywhere--soups, bagels, pasta sauce, even low-fat yoghurt. Research over the past few years has provided a much clearer understanding about how sugar should be treated as part of a diabetic or sugar-free diet. Even so, there are still misconceptions about what a sugar-free diet means, exactly. Type 1 diabetes is a disease in which the immune system attacks the insulin-producing cells of the pancreas. 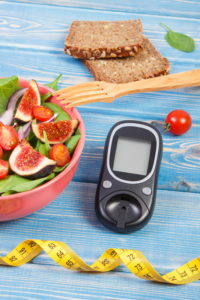 Insulin is the hormone that allows blood glucose to be taken up and used for energy by the body’s cells; when the pancreas cannot produce enough of it, blood glucose levels rise. The amount of sugar someone eats has no bearing on whether or not he or she will develop type 1 diabetes. Type 2 diabetes is a disease in which the body’s cells are resistant to the effects of insulin, resulting in high blood glucose levels. Being overweight is a significant risk factor for type 2 diabetes. Because weight gain occurs when you consume more calories than your body needs, and because foods high in sugar are also high in calories, sugar—along with other high-calorie foods such as fats—may play an indirect role in type 2 diabetes. Do I Have to Eat a Sugar-Free Diet If I Have Diabetes? In the past, people with diabetes were told to avoid all sugar. This was in part due to a lack of research on the effect of sugar and in part due to the fact that the types of insulin that were available were very limited and restrictive, leading to less flexibility in blood glucose management. Sugar can be found naturally in carbohydrate-containing foods such as fruits, vegetables, and dairy products. These types of carbohydrates are actually an important part of our diet because they contain fiber as well as glucose, which is the brain’s preferred nutrient source. Added sugars, sometimes called “free” sugars, are those used to enhance processed foods or baked goods; the phrase also refers to table sugar we may add to our food. These added sugars are the sugars health care providers recommend minimizing in a healthy, balanced diet because they contain no nutritional value. What scientists have discovered is that while added sugars are “empty calories,” it’s really the total amount of carbohydrates in your diet that has the greatest effect on normal glucose levels. As a result, most health care providers will say you do not need to have a total sugar-free diet; rather, be mindful of the total amount you are consuming in a day. For example, if you want to indulge in a cupcake after a meal, remove other carbohydrates (such as potato or bread) from that meal in anticipation of the carbohydrates you’ll consume in the cupcake. What Are the Best Sources of Sugar? Most health care experts will agree that the best sources of sugar are those naturally occurring in foods such as fruits, vegetables, whole grains, and dairy products because these foods are important sources of fiber, calcium, and other vitamins and minerals. It’s important, however, to be smart about the choices you make when it comes to these foods. Eat fresh fruit or cooked fruit without added sugar. Avoid canned fruits mixed with sugary syrups. Be mindful that a serving of dried fruit (typically just about one tablespoon) is considerably smaller than a serving of fresh fruit (one small apple, for example). Avoid fruit drinks, juices, or smoothies that often have added sugars and do not contain the fiber and other nutrient benefit of whole fruits. Eat raw or steamed vegetables. If you want to add a small amount of fat, try to use healthy unsaturated fats such as olive oil. Avoid fried vegetables, which are higher in calories and saturated fats. For seasoning, consider herbs, vinegars, or lemon juice. Skim milk and low-fat yogurts provide calcium and, if fortified, vitamin D.
If drinking a milk substitute such as soy or nut milk, look for the unsweetened versions. Watch out for added sugars in some yogurt products. The best whole grains are foods you prepare at home such as brown rice, quinoa, and whole oats. When buying prepared products advertising whole grains, be sure to look at labels to see if the whole grain is the first ingredient. This is a question best suited for your health care provider and dietician as it is depends on your weight, your activity or exercise level, your nutritional goals, and your diabetes medication regimen. The key is to aim for a specific sugar intake goal. Some experts recommend that adults should plan for no more than 30 grams of sugar a day, which is equivalent to about 7 teaspoons of sugar a day. An 11-ounce glass of orange juice can contain 7 teaspoons of sugar, so it’s important to plan your breakfast portions—and those of other meals—wisely. Added sugar is not always listed as just “sugar.” There are many other sources of added sugar, including: corn syrup, molasses, honey, sucrose, maltose, maple syrup, coconut palm sugar, rice syrup, agave nectar, beet sugar, cane syrup, and hydrolyzed starch. Additionally, many foods will contain sugar alcohols such as erythritol, mannitol, and mallitol, among others. While these sugar alcohols have less “sugar” content, they still contain carbohydrates and calories. Many products labeled “reduced sugar” or “low-fat” often have high sugar or carbohydrate content as means of maintaining the flavor or consistency that would otherwise have been affected by removing fat. Checking food labels for sugar and carbohydrate content is a good way to keep track of your intake. You may be surprised by the number of foods containing added sugar, including some ketchups, pasta sauces, and low-fat yogurts. Sugar substitutes such as the artificial sweeteners aspartame (Equal, Nutrasweet), sucralose (Splenda), saccharin (Sweet’N Low, Sugar Twin), and acesulfame potassium (Sunnett, Sweet One) along with the naturally derived stevia (Truvia, Pure Via) can be used to sweeten your food without adding calories or sugar. However, many foods made with these substitutes also contain fats and other sources of calories (including sugar alcohols), so remember that sugar-free diet does not always mean calorie- or carbohydrate-free. If you have diabetes, you should consult your health care provider about the best dietary regimen for you based on your individual health. However, most experts agree that for all people, including those with diabetes, eating a healthy, sugar-free diet is best for your health. Sugar can be a small part of that diet if you monitor portions and keep track of your daily intake. Originally published in May 2016 and updated. 2 diabetes, add, artificial sweeteners, balanced diet, blood glucose levels, brain, breakfast, calcium, calories, corn, corn syrup, dairy, diabetes, diabetes medication, diabetes type, diabetes type 2, diabetic, diet, diet advice, empty calories, exercise, fiber, food, glucose, glucose levels, Glycemic index, glycemic index chart, health, health news, healthy balanced diet, honey, hormone, immune system, insulin, milk, normal glucose levels, nutritional value, Pancreas, people with diabetes, potassium, prediabetes, processed foods, quinoa, sources of fiber, soy, stevia, sugar, sugar free diet, type 1 diabetes, type 2 diabetes, university health news, vegetables, vitamin, vitamin d, vitamins, vitamins and minerals, weight gain, whole grain, whole grains, yogurt.